What’s the collective noun for a group of Twitter bots? Inspiration is failing me at the moment, so let’s just say that the Trove bot family recently welcomed a new member — @TroveBot. 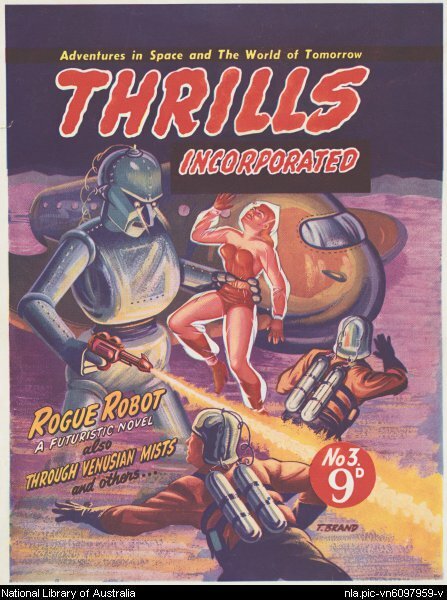 Proof cover for Rogue Robot, Thrills Incorporated pulp series, 1951. By Belli Luigi. @TroveBot is a sibling of @TroveNewsBot, who’s been tweeting away since June last year. But while @TroveNewsBot draws his inspiration from 120+ million historical newspaper articles, @TroveBot digs away in the millions of books, theses, pictures, articles, maps and archives that make up the rest of Trove. Trove, as we always like to remind people, is not just newspapers. Like @TroveNewsBot, the newcomer tweets random finds at regular intervals during the day. But both bots also respond to queries. Just tweet a few keywords at them and they’ll have a poke around Trove and reply with something that seems relevant. There’s various ways of modifying this basic search, as explained on the GitHub pages of TroveNewsBot and TroveBot. @TroveBot’s behaviour is a little more complex because of Trove’s zone structure. The zones bring together resources with a similar format. If you want to get a more detailed idea of what’s in them, you can play around with my Zone Explorer (an experiment for every occasion!). If you just tweet some keywords at @TroveBot he’ll search for them across all the zones, then choose one of the matching zones at random. If you want to limit your search to a particular zone or format, just add one of the format tags listed on the GitHub site. Let’s say you want a book about robots, just tweet: ‘robots #book’. Or a photos of pelicans, try ‘pelican #photo’. It’s really that easy. But you don’t just have to use keywords, you can also feed @TroveBot a url. Perhaps you want to find a thesis in Trove that is related to a Wikipedia page — just tweet the url together with the tag ‘#thesis’. Yes, really. Behind the scenes @TroveBot makes use of AlchemyAPI to extract keywords from the url you supply. These keywords are then bundled up and shipped off to Trove for a response. You probably know that @TroveNewsBot is similarly url-enabled. This allows him to do things like respond to the tweets of his friends @DigitalNZBot and @DPLABot, and offer regular commentary on the ABC News headlines. So what would happen if @TroveBot and @TroveNewsBot started exchanging links? Would they ever stop? Would they break the internet? With the Australian Tennis Open coming to a climax over the last few days I thought it was a suitable time to set up a game of bot tennis. To avoid the possibility of internet implosion, I decided to act as intermediary, forwarding the urls from one to the other. The rules were simple — the point was lost if a bot failed to respond or repeated a link from earlier in the match. And now @trovebot has missed one completely. He’s looking rattled. Amazing fightback from @TroveNewsBot. Advantage TroveNewsBot. As a sporting spectacle the inaugural game wasn’t exactly scintillating. In fact, the first game is still locked at 40-40. But it’s been interesting to see the connections that were made. It’s also been a useful opportunity for me to find bugs and tweak their behaviours. You can catch up with the full, gripping coverage via Storify. After a few more experiments I’m thinking I might try and set up a permanent, endless conversation between them. It would be fascinating to see where they’d end up over time — the links they’d find, the leaps they’d make. Hmm, collective nouns… What about a serendipity of bots? A twaggle of twitter bots.